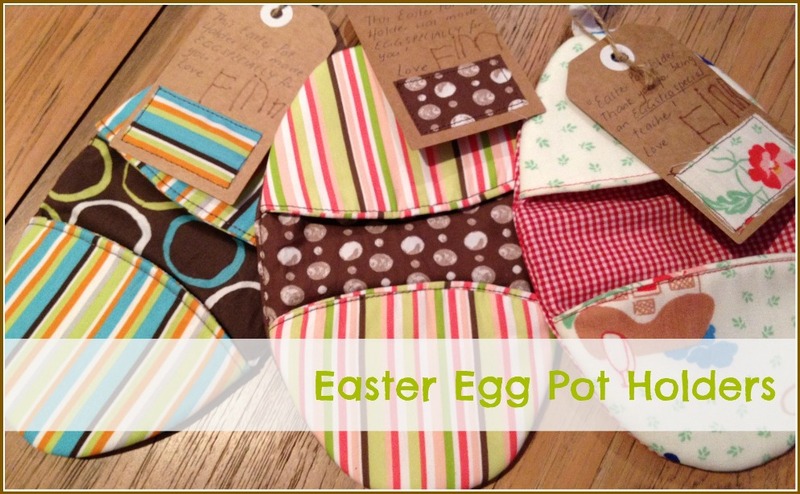 I made these quirky little Easter Egg Pot Holders last year for my son's teachers. They are very easy to make and would suit a beginner sewer. I made them using a pattern and tutorial designed by Kelly at Miss Mary Sews - which you can see here (she also does fabulous sewing classes if you live in the Perth area). The only thing I added to Kelly's pattern was a loop at the top of each pot holder so they could be hung up. Her tutorial is very clear and is really easy to follow. It's a great little project for all those fabric scraps you have laying around and really is a nice alternative to giving chocolate. Happy Easter everyone, stay safe, eat well and enjoy your break! Oh, and don't forget to post me a pic if you happen to get into crazy Easter sewing and whip up some of these little lovelies. Those are a really great idea. Love them. These are so adorable. What a super fun idea! I'm pretty sure just about everyone could use potholders at any given time... I might have to make these for some of my relatives!